If U.S. Highway 61, which runs from the Canadian border in northern Minnesota to New Orleans, is "the Blues Highway'', then U.S. Highway 67, which in its heyday ran from Iowa to Mexico, is the "Rock And Roll Highway''. 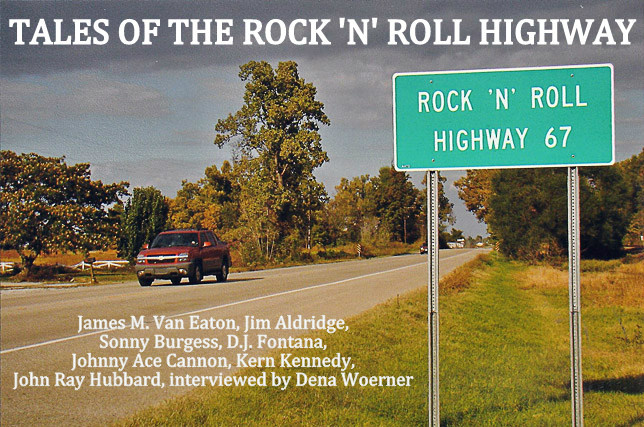 In rock and roll terms, the crucial stretch of Highway 67 was the part in northeastern Arkansas that ran through such burgs as Batesville, Newport, Swifton, Trumann and Walnut Ridge. Not too far from Memphis, where the rockabilly explosion was centered from 1955 to 1959 or so, Highway 67 boasted a swath of funky roadhouses and disreputable dives that appealed to the earliest crop of rockers, who piled into their Chevies and worked their way up and down this strip, leaving booze-fueled, pill-popping, duck-assed mayhem in their wakes. The reason I'm bringing all this up is that the Arkansas Legislature is on the verge of designating the stretch of the road through Jackson, Lawrence and Randolph counties as "Rock And Roll Highway 67'', which, Rep. J.P. Richards of Walnut Ridge hopes, will spur tourism. Its history is indeed rich and its legend got a big boost from Joaquin "Hip Hop" Phoenix's turn as Johnny Cash in Walk the Line, in the scenes where he and fellow Sun Records rockabilly killers, like the 1950s icons they were, were all piled into a car, speeding along in the country darkness at night, dreaming big dreams of where their powerful music will take them. Despite the burnishings of the movie, I doubt the actual reality of northeast Arkansas was all that glamorous. From what I've been able to piece together from my mad Internet searching skillz, northeastern Arkansas actually sucked pretty bad back then (it may still, for all I know). There was a lot of cotton to be picked under a hella hot sun, and if you were poor (and most people were), black or white, you spent most of your days working in the fields. At night you were listening to barn dance shows like the Grand Ol' Opry or the Louisiana Hayride on your crappy tube radio. On Saturday nights, if you were white, you might find yourself at a someplace like the Silver Moon Club in Newport or the B&I Club in Swifton. As described by the Encyclopedia of Arkansas History and Culture Project, "Some (of these) establishments were small, rough country venues where farmers in bib overalls arrived on tractors, seeking evenings of excessive drinking, fighting, and flirtation. Some clubs, such as Beverly Gardens in Little Rock, could accommodate 200 to 300 people. The largest club in Arkansas at this time was the Silver Moon in Newport, which could seat more than 800 people''. Weekend after weekend, folks there could watch the influential figures in early rock and roll history roll through town, people like Elvis Presley, Johnny Cash, Carl Perkins, Charlie Rich, Jerry Lee Lewis, Conway Twitty, Levon Helm, Narvel Felts, Sleepy LaBeef, Sonny Burgess, Billy Lee Riley, and Ronnie Hawkins. They all got their starts playing live gigs in dives along Highway 67, singing their sexed-up, crazy-fast, three-chord odes to cars, parties and fast living to a downtrodden bunch of Arkansas farmers and bored kids desperately seeking some release from a poverty-stricken reality. This is what rock and roll originally meant and was what gave it its credibility. And as such, a "Rock 'n' Roll Highway" deserves to be recognized. But, assuming the Arkansas Tourism Board grabs this idea and runs with it, what will pilgrims actually see when they get down to Jackson County and the surrounding environs? The best answer comes from the website of Scotty Moore, Elvis' guitarist for 14 years, where photographer and guitar enthusiast James V. Roy chronicled his own visits in 2007 to the scenes of Elvis' early tour stops, including those in northeast Arkansas. The answer is: not much is left of these places. Unless you count bits of terrazzo left baking under the Mid-South sun to be transcendent experience. For instance, in Newport, the Silver Moon, which was the home to many performances by Elvis and the rockabilly greats, has been reduced to a few square feet of bathroom tile floor on top of a concrete foundation. It sits next to a Quonset-hut-looking building that is the current Silver Moon (halfway down the page). I mean, this is akin to archeology. In better shape is Bob King's B&I Club in Swifton, Arkansas. At least that's still an actual building. It's actually still open and called Bob King's King of Clubs, divided, Roy says, into two sectors: a bar and a "private dance club" open to members only. The owner of the illustrious club died last year at age 83. "He was one of the best club owners I ever knew'', said Sonny Burgess. Other clubs on the "Rock And Roll Highway" included the Cotton Club in Trumann, Arkansas, where Jerry Lee Lewis and Roy Orbison put on legendary shows, as well as Mike's 67 Club and Porky's Roof Top Club in Newport. Good luck finding what's left of these places, Arkansas travelers. The one thing that a "Rock And Roll Highway" makes you realize once again, however, is where this musical phenomenon came from, and why white America will probably never again come up with anything as authentic. Where it came from was poverty, the grinding hopelessness that was the norm in the rural South of that era is what caused it, and the emergence of media technology is what turned it into a force. Note that the suffering came first, then the technology, which is the opposite of how it works today. Maybe if the next Great Depression turns us all into shoeless cotton pickers again, and social taboos are separating us from another race (Muslims this time?) whose attitude we can cherry-pick, we'll be able to come up with another phenomenon like Arkansas rock and roll. by Don Jacobson, January 21, 2013.